Without peace in South Sudan, millions of people will go hungry and millions of women and girls could be raped as they try to go about their daily lives, including as they search for food, a senior United Nations official today warned. “While humanitarians will continue to do all that is possible to alleviate suffering, the fact remains that unless the guns fall silent, the humanitarian situation will continue to deteriorate,” said Eugene Owusu, Deputy Special Representative of the Secretary-General and UN Resident and Humanitarian Coordinator in South Sudan. Speaking to journalists in Juba about the violence and related food insecurity facing the country, Mr. Owusu noted that 7.5 million people are in need of humanitarian aid and an estimated 3.5 million have been uprooted from their homes. That figure includes many women and children, who have sought shelter in places such as swamps and subsisting on water lilies, to get away from fighters. Cases of sexual assault and gender based violence increased by 64 per cent in 2016 compared to the previous year, according to a recent survey cited by Mr. Owusu. “Against a backdrop of prevailing impunity, a major fear for women and children in this country is, sadly, the fear of being raped,” he told the press. He noted “repeated” challenges to reaching people in need as a result of insecurity and access denials at the sub-national level. In addition, at least 83 aid workers have been killed since the latest outbreak of violence in December 2013, with three contractors killed just last month. Funding is another concern, with only about 27 per cent of the $1.6 billion appeal met so far, according to the UN Office for the Coordination of Humanitarian Affairs (OCHA). 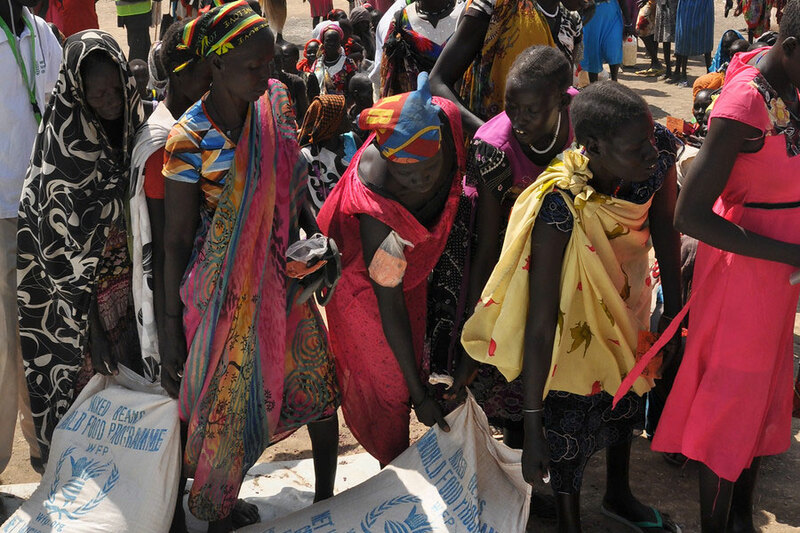 Despite these challenges, UN and international donors have worked with the Government to deliver lifesaving aid to at least 1.6 million people, including to some 400,000 people affected by the famine in Leer and Mayendit. “Our response has focused on scaling up food assistance, nutrition and health provisions, WASH [water, sanitation and hygiene], and enhancing livelihood opportunities for those unfortunate citizens in those parts of the country,” Mr. Owusu said, using the common acronym in the humanitarian community for water, sanitation and hygiene. Ultimately, he noted, the long-term answer to the humanitarian situation is recovery, stabilization and development. He called for investment in livelihoods, tightly linked to peace and relative security at community levels, to build up resistance and support basic social services to the most vulnerable in society.